Implants are dental devices used to replace the roots of missing teeth, and consist of a small titanium screw placed in the jawbone via surgery. After the implant is in place, the replacement tooth/teeth (e.g. crown, bridge or denture) will be placed over the implant. At Neo Smiles, you can use Medisave to claim for your dental implant surgery. Dental implants are not suitable for young children as the jaw bone is still developing. 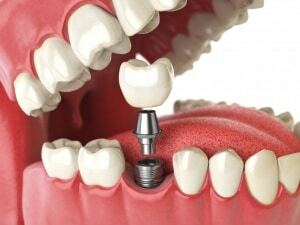 There is no upper age limit for dental implant treatment in healthy adults. Smokers experience a lower success rate of dental implant treatments, and patients with chronic gum diseases should ensure the diseases are under control prior to starting implant treatment. Some patients with long-term tooth loss may require additional site preparation such as bone grafts or sinus lists prior to implant treatment. During the initial consultation, our dentist will assess the area under consideration for the implant visually, with X-rays and teeth impressions. We will discuss the various options available to you, and the related costs and risks. When proceeding, our dentist will surgically embed the titanium implant into the jaw bone under local anaesthesia. The incision on the gum is stitched and allowed to heal, and for the implant to fuse with the bone. This may take 2 - 3 months or longer. At the follow-up session, our dentist will then surgically expose the top part of the implant to take the necessary impressions for the fabrication of the implant crown. Do expect some amount of discomfort (e.g. swelling, light bleeding) initially. We advise you to rest, avoid exercise and hot food/beverages within the first two days after surgery. Painkillers and antibiotics may be prescribed as needed. Antiseptic mouthwash will also be provided to keep the surgery area clean. We will schedule a follow-up visit one week later, and three months to check on your implant and ensure that it is healing well, and ready for the final crown. Yes, Medisave can be used for the dental implant surgery. Crowns are not covered by Medisave. Please click here to view the necessary documents needed to use your Medisave for your dental implant surgery. Book Your Dental Implant Consult Today!